One of our favourites here, and a vegetable that doesn’t seem to appear on many tables nowadays, is the tasty parsnip, a root vegetable related to the carrot. Presently in season in Australia, they can be roasted, mashed, boiled, added to soups, stews, pureed as a base for a cut of grilled fish, or done how we like them, roasted in a parmesan crumb; a dish that is yummy hot or cold. They can also form part of another in season at present vegetable, the zucchini. All dishes here can be served as nutritious meals on their own or as side dishes. Thanks for this recipe goes to Damian Sansonetti, chef of Shallots NY. In a large pot, heat the oil over medium heat. Add the onions and saute about 6-7 minutes or until translucent. Add the celery and garlic; sauté 2 minutes longer. Add the parsnips, potatoes, and chicken or vegetable stock. Bring to a boil. Cover and reduce heat to low; simmer about 30-35 minutes or until the vegetables are very tender. Let cool. Transfer the soup in batches to a blender and puree. You can also use a handheld immersion blender to puree the mixture until smooth. Season with salt and pepper. For extra smoothness, you can strain the soup through a fine sieve . Garnish with fresh chopped chives in the center of each bowl, if desired. If the soup gets too thick for you if storing overnight, simply thin with a little extra stock. Using a food processor fitted with the medium grating disk, grate the potatoes and parsnips separately. Put the potatoes in a clean kitchen towel and squeeze out as much liquid as possible. In a large bowl, combine the potatoes, parsnips, spring onions, eggs, flour, 2 tsp. salt, and a few grinds of pepper and mix well. Generously oil a heavy frypan and heat over medium heat. Working in batches, spoon about 1/3 cup of the mixture onto the griddle at a time to form pancakes. Flatten the pancakes with a spatula (they should be about 1/2 inch thick) and cook until the bottom is well browned and crisped, about 5 minutes. Flip and cook until the other side is well browned, about 5 minutes more. Sprinkle with salt. Serve immediately or keep warm in a low oven until ready to serve. 1. Preheat oven to 180 degrees C. Boil water in a large, wide-rim pan. Season with salt and add zucchini. Lower heat to Medium; cook 5-7 minutes until tender, but still slightly firm. Rinse under cold water and pat dry. 2. Trim ends of zucchini and slice them in half lengthwise. Use a small knife to outline the pulp. Do not cut too far down. Using a small spoon, such as a demitasse spoon, scoop out pulp. Place pulp in a fine wire sieve and let drain for 20 minutes. Turn zucchini shells over and let drain. 3. Bring a pot of water to a boil; season with salt. Add parsnips and lower heat to Medium. Cook 5-6 minutes or until tender. Drain and rinse with cold water. 4. After zucchini pulp has drained, use the back of a rubber spatula and push down on the pulp to release any excess liquid. Puree zucchini and parsnips in a blender or food processor. Add cream, 3 Tbsp butter, salt and pepper. Pulse to combine. Taste and adjust seasoning if needed. 5. Melt the remaining 2 Tbsp butter in a small skillet over Low heat. Add breadcrumbs; cook until nicely browned. Do not burn. 6. Place zucchini shells in a butter baking dish. Using demitasse spoon, fill zucchini shells with puree and top with bread crumbs. Place in the oven and cook 10-20 minutes, until stuffing is hot. The parsnip (Pastinaca sativa) is a root vegetable closely related to the carrot. It is a biennial plant usually grown as an annual. Its long tuberous root has cream-colored skin and flesh and can be left in the ground when mature as it becomes sweeter in flavour after winter frosts. In its first growing season, the plant has a rosette of pinnate, mid-green leaves. If unharvested, it produces its flowering stem, topped by an umbel of small yellow flowers, in its second growing season. By this time the stem is woody and the tuber inedible. The seeds are pale brown, flat and winged. The parsnip is native to Eurasia. It has been used as a vegetable since ancient times and was cultivated by the Romans, although there is some confusion in the literature of the time between parsnips and carrots. It was used as a sweetener before the arrival in Europe of cane sugar. It was introduced into the United States in the nineteenth century. While folk etymology sometimes assumes the name is a portmanteau of its close relatives parsley and turnip, it actually comes from Middle English pasnepe, alteration (influenced by nep, turnip) of Old French pasnaie (nowpanais) from Latin pastinum, a kind of fork, whose ending was changed to -nip by analogy with turnip because it was assumed to be a kind of turnip. The parsnip is usually cooked but can also be eaten raw. It is high in vitamins and minerals, especially potassium. It also contains antioxidants and both soluble and insoluble dietary fiber. It can be cultivated in deep, stone-free soils and is attacked by the carrot fly and other insect pests, viruses and fungal diseases, of which canker is the most serious. In sunlight, handling the stems and foliage can cause a skin rash. Parsnips resemble carrots and can be used in similar ways but they have a sweeter taste, especially when cooked. While parsnips can be eaten raw, they are more commonly served cooked. They can be baked, boiled, pureed, roasted, fried or steamed. When used in stews, soups and casseroles they give a rich flavor. In some cases, the parsnip is boiled and the solid portions are removed from the soup or stew, leaving behind a more subtle flavor than the whole root, and starch to thicken the dish. Roast parsnip is considered an essential part of Christmas dinner in some parts of the English-speaking world and frequently features in the traditional Sunday Roast. Parsnips can also be fried or thinly sliced and made into crisps. Parsnips can be made into a wine that has a taste similar to Madeira. In Roman times, parsnips were believed to be an aphrodisiac. A typical 100 g parsnip contains 75 Calories (230 kJ) of energy. 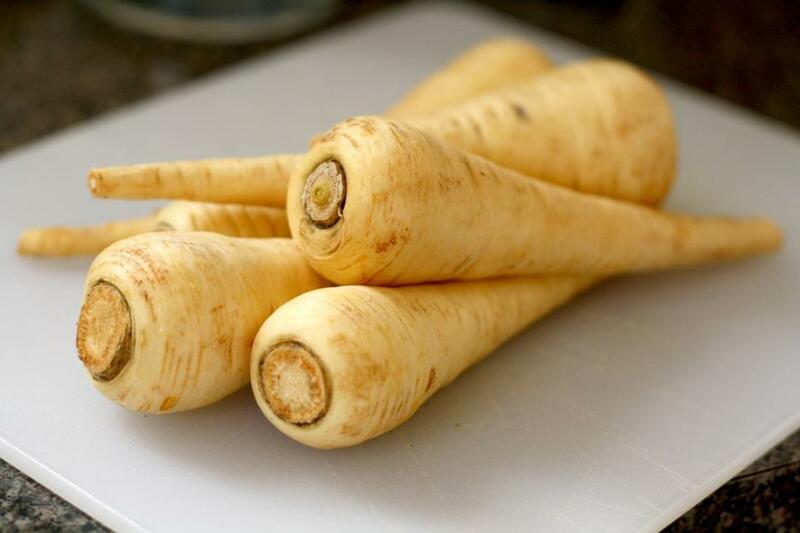 Most parsnip cultivars consist of about 80% water, 5% sugar, 1% protein, 0.3% fat and 5% dietary fiber. The parsnip is rich in vitamins and minerals and is particularly rich in potassium with 375 mg per 100 gm. Several of the B-group vitamins are present but most of the vitamin C is lost in cooking. Since most of the vitamins and minerals are found close to the skin many will be lost unless the root is finely peeled or cooked whole. During frosty weather, part of the starch is converted to sugar and the root tastes sweeter. The consumption of parsnips has potential health benefits. They contain anti-oxidants such as falcarinol,falcarindiol, panaxydiol and methyl-falcarindiol which have anti-cancer, anti-inflammatory and anti-fungalproperties. The dietary fiber in parsnips is partly of the soluble and partly the insoluble type and comprisescellulose, hemicellulose and lignin. The high fiber content of parsnips may help prevent constipation and reduceblood cholesterol levels. nla.pic-vn5056690 PIC LOC Poster Drawer Tasmanian carrots & parsnips [Tasmania? : s.n., 193-?]. Courtesy National Library of Australia. Copyright Pittwater Online News, 2013. All Rights Reserved.